Originally made for a Carno production.. which never came to be, I have since decided to release them out instead. Here is a collection of TS beta voxel remakes. Several people have asked for them, but I'm quite suprised that (as far as I know) no one has tried to make them before. I liked the beta voxels because they in some ways held a better clearer shape than the final WW voxels. But in all honesty, all the beta voxels are, are empty shells of the model with no detail and 90% remap. As a result, I didn't put much effort into them (wasn't really that much to put in..) and I have no intention of doing more work on them. Most are simple reskins and a little bit of fiddling and bodging, a few are a complete remake. Nod Tick Tank - Reskin + Second Barrel added. Nod Heavy Tank - This is a complete remake, and based on a single beta screenshot. 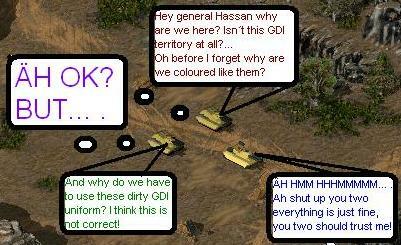 (The one with the H-MLRS coming over a just destroyed bridge fighting Nod mammoth tanks on a snow map.) It has 2 missile racks on the side. Nod Artillery - This is the mobile artillery voxel and a complete remake. It comes in two flavours: Seperate barrel and chassis, and a 2-section voxel (Arty2), both with their own HVAs. Nod Stealth Tank - Complete remake. Picture Included, hopefully you'll be able to tell which is which..
OMG. THEY LOOK AWESOME!!! So similiar to the beta ones!!! 10/10!!! sweet i likes nice job. i think i have a use for these. omg,omg,OMFG!!! these are awesome fantastic job muldrake. Can I use some of these in my mod, with a proper credit of course? Yes, thats why I put them up. You are welcome to use them, providing you give proper credit. Very wooty AWESOMEDUDE!! Nice voxels! Carniwhore: Thanks for the constructive critism, but as I've said before, I won't be working on them any more. The normals are auto-normals, simply because I didn't want to spend the time on them. If you want to update them, then do so. So what was the Carno thing supposed to be? Jesus f**king Christ Muldrake. You are a god send. 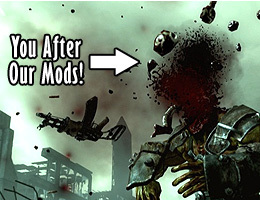 You have just saved me ALOT of time on my mod. THANK YOU. tnx, alot, dude..of course I'll give you credit for them..I may re-color them, but still, you made the base for them. DoMoNiC_HuNtEr: Ask Carno.. I believe it was a beta remake. Glad I could help with the voxels.. like I said, I'm suprised no one tried to make them before. I kinda feel a bit bad about some of them now, I may work a bit more on them. Don't expect anything, but at the same time look out just in case. All the units which needed normal correcting have been done so. The htnk has a higher turret and body, as suggested. I'm not going to make screens of all of them again. And I will not put any more effort into these, as I have to admit right now, I'm not just not in the mood for it. Sorry. I was going to do a Beta-TS thing, then Xeno came along. So, I said 'aaah, fuggedaboudit'. I MAY have my old Beta-TS harvester on my PC for you, Xeno. I cant guarentee that I do, though. I'll look. I'm suprised no one tried to make them before. I remade the Heavy tank..
And the rest, just nothing compared to yours..
That would be Sweet Carnotaurus! omfg did you post these. Love MLRS, its the worlds most dangerous artillery!! Posted: Sun Mar 07, 2010 6:37 pm Post subject: I think your BETA designs are perfect!!! The designs really look like from the first screens but why don´t you made the beta versions of the titan mech, the mcv, the harvesterand and the nod laser turret too??? P.S. here comes a little NOD joke screen I hope you like it! old topic is 4 years old.